There is a poem saying where your pleasure is, there is your treasure; where your treasure, there your heart; where your heart, there your happiness. The meaning of life is to follow your heart and find the true happiness. Fosjoas motorized skateboard K1 makes the surfing on land unique and brings the rider fantastic experience and unexpected happiness. Firstly, Fosjoas wireless remote control skateboard K1 frees the heart to the largest extent to guide any movement or direction only with the skater's hand. Variable speeds can be achieved by the 2.4G handheld remote control, which makes surfing on land much easier and more intelligent. Like a private car owner, the user of Fosjoas electric skateboard K1 can also feel the sense of distinction and royalty, thus having a deep emotional connection with the skateboard. Secondly, as a fantastic means of transportation, Fosjoas motorized skateboard K1 self-balancing two wheel electric scooter is a perfect combination of speed and passion, comfort and safety. Skateboarding was originally known as "sidewalk surfing" and early skaters imitate surfing maneuvers and styles. Later, with the increasing popularity of the sports, the skaters emphasize on finding new places and experiencing new exciting tricks. Tricks mainly consist of riding on two-wheels, spinning on the back wheelies or jumping over the bar and landing on the ground. All of these actions require high quality of the skateboard and comfort skating experience. Fosjoas electric skateboard K1 is a perfect choice for those adventure-lovers. The front and rear wheels have been equipped with PU materials damper mass for smooth riding. Each part of the skateboard is working independently so when a single part has a problem, the whole system will continue to work efficiently. In addition, equipped with a world famous brand Cheng Shin tyre, Fosjoas maple skateboard K1 is anti-skid and has good resistance to abrasion with excellent grip effect. Hence, Fosjoas K1 can adapt to various kinds of the road conditions. 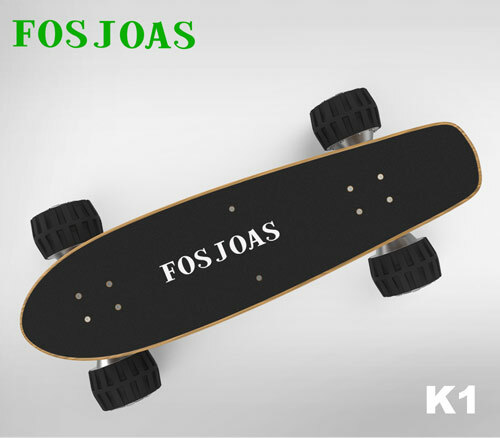 Fosjoas cheap electric skateboard K1 helps the rider experience passion and comfort as well.